Louis Jacques Monde da Guerre took on humanity’s goal to capture memories. Memories are captured in many forms, such as books and paintings. But these couldn’t outlast aging and couldn’t be created fast enough. Although he knew nothing about science, he wanted to create technology to capture scenes and moments. This is how he became the world’s founder of photography. Louis Jacques Monde da Guerre was born on 18th of November, 1789 in his hometown Cormeilles-en-France. At a young age, he showed the traits of a talented artist. At 16, he was accepted as an apprentice under the painter Degotti. Degotti himself is a great scene painter, which he passed on to his apprentice. He became a great painter under Degotti. His specialty was painting backdrops for plays and operas. But he always felt the scenes were lacking immersion even with a great backdrop. In 1822 with the help of Charles Bourton, they both created “diorama” which was layers of fabric that were painted on then layered with actual objects. It also can be lighted with a source of light to simulate day and night. This is why diorama became a piece of popular equipment in many theaters across Paris. Creating the diorama required him to use camera obscura to ease his job. It’s an early version of photographic equipment which can only be used to project objects it was pointed at. He often tinkers with the camera obscura to learn its functions. He also upgraded the lenses so he could draw the scenes better. This equipment gave him inspiration for a new invention. Then, Nicephore Niecpce met him in 1829, and they became partners. Niepce had interests with the camera obscura, and in return, he would give his heliographic process information. With no particular scientific skills, Louis Jacques Monde da Guerre needed help to advance his invention. He met a chemist, Dumas, who funded his cause and gave scientific advice. 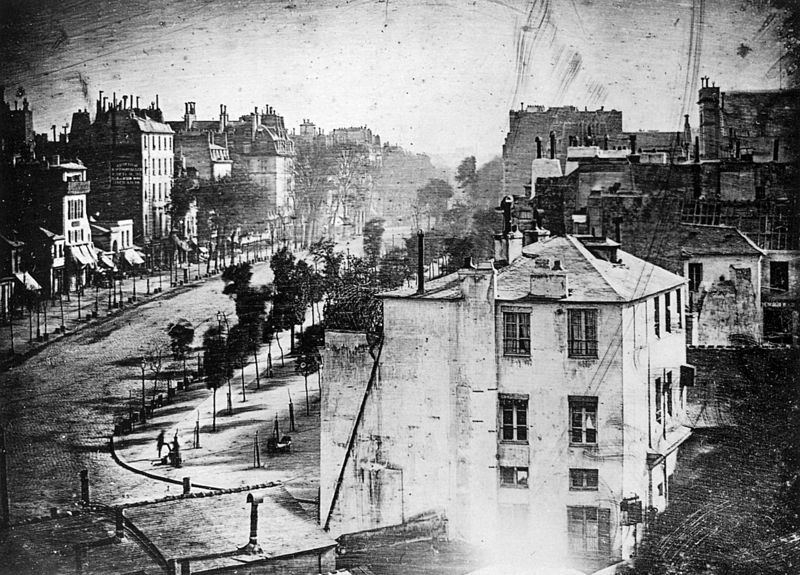 After two years since he met with Dumas, he created the first “daguerreotype”. It was a result of a silver iodide coated copper plate exposed to light focused by a camera. To capture the picture, the plate was exposed to mercury vapor. The resulting image was then fixed by a salt solution, which then became a permanent picture. Daguerreotype images were very resilient, capable of lasting way longer than paintings and can be easily made. Soon enough, its potential caught the public eye. It became so wanted, that the French government acquired so it can be freely shared with the public. He got 6000 francs a year as compensation and sealed his name in history. The contribution by Niepce and then his son Isidore had a tremendous impact on the inner workings of the lighting. Dumas is the one who supported and helped with the chemistry. With Louis Jacques Monde da Guerre, all of them became the founders of modern photography. After his death on November 18th, 1787, people would continue developing his work until today.